You may want to make extra, because leftovers are fantastic for lunch the next day. Prepare a charcoal or gas grill for high heat (450° to 550°; you can hold your hand 5 in. above cooking grate only 2 to 4 seconds). In a small bowl, mix garlic, lemon juice, tahini, yogurt, and salt. Set aside. Brush eggplant and tomatoes with oil. Grill, turning often, until softened and grill marks appear, about 6 minutes. Cut tomato wedges in half. Warm naan on grill. 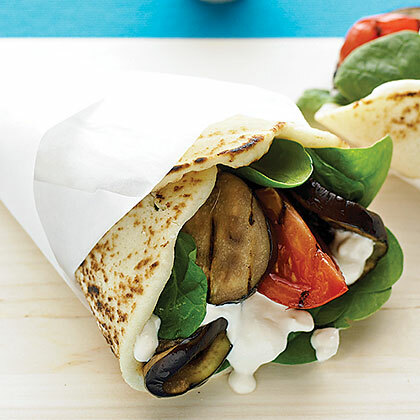 Lay each naan on a plate and top with 1 1/2 cups spinach, a few slices eggplant, 4 tomato pieces, and a large spoonful of reserved yogurt mixture.